click on the image above to download a copy of the briefing paper. The TC17 project focuses on the transition period from adolescence to adulthood in two vulnerable groups of young people: those in the care of the local authority and those receiving psychological help from the Child & Adolescent Mental Health (CAMH) service. Estimates suggest that around one third of young people who are referred to adult mental health services from CAMH do not take up regular appointments. Around 50% of adolescents in care suffer from mental illness. Their relatively poor social, economic and health outcomes in early adult life may be due in part to the absence of collaborative psychiatric management in their teenage years. There is very little data on early adult wellbeing for either of these vulnerable groups. We set out to identify factors which may influence successful transitions, and to understand the ways in which services may need to change in order to improve outcomes for young people with mental health needs. This has led us to consider new ways a clinician or social care professional can assess a young person’s readiness to deal with transition. Our work with young people in care has led us to devise and pilot a training module for foster carers, a core component of which is a short animated film, made by local young people in care ‘My name is Joe’, which proved to be a very positive experience for all involved and a way of engaging young people through the use of animation. Service mapping exercise: Our technical report ‘Child and Adolescent Mental Health and Social Care Services in Cambridge and Peterborough: A quantitative mapping exercise’ details the service framework within which we are undertaking our research. ‘Perceptions of Barriers to Service’ Questionnaire (PBS): Poor engagement by young people with services is a well-documented problem and may have a significant impact at this crucial time of transition. This accessible, short self-report questionnaire was developed with young people as a core measure for use in the TC17 study. 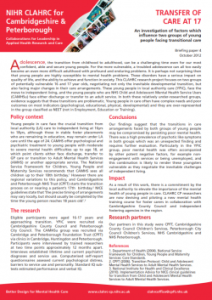 Longitudinal survey of young people in care and CAMH service users: 27 young people in care and 26 CAMH service users were interviewed at age 17 as they face their transition out of care/CAMH services and followed up 12 months, post transition. Young people in care advised on the measures, the questions and how to conduct the interviews. Phase two has just been completed one year after initial interview and analysis will begin shortly. Policy analysis: We have attracted funding from the charity Kids Company to explore how child mental health policies have impacted on service delivery in health and social care. The TC17 research identified a toxic cycle wherein mental health problems in young people in care fed placement breakdown which, in turn, exacerbated mental health problems. As a result we are now developing a mental health training programme for foster carers, so that they are better equipped to detect the early signs of emotional and behavioural disorder in children. This would help reduce placement breakdown, improve mental health and emotional wellbeing and enhance the future life chances for these young people. Our partners include NHS Cambridgeshire, NHS Peterborough, CPFT, Cambridgeshire County Council, Peterborough City Council, Kids Company.